The San Jose Police Department in southern California has opened an internal investigation after video footage began to go viral of several officers kicking and beating a man while attempting to apprehend him. A recording of the Saturday evening arrest of 22-year-old Juan Moreno-Lopez was captured on the cell phone of an eyewitness who then uploaded the video to the internet. In less than two days, the original clip has been viewed on Facebook more than 340,000 times. The three-minute recording shows several officers attempting to arrest Moreno-Lopez and captures them eventually resorting to beating him with batons and striking him with closed fists. “Don’t hit him, it’s only one person,” a witness is heard yelling in the background. According to the San Jose PD, officers tried to approach Moreno-Lopez on Saturday evening when he threw something in a bush and took off running, Mercury News reported. Authorities allege the man then confronted at least two officers in the middle of the road and attempted to attack one of them with a bottle, prompting them to call for backup. Moreno-Lopez was taken to a nearby hospital after his arrest for treatment and later booked into jail. He was booked on suspicion of assault with a deadly weapon, resisting arrest, being under the influence of a stimulant, possession of methamphetamine and destruction of evidence, Mercury News reported. 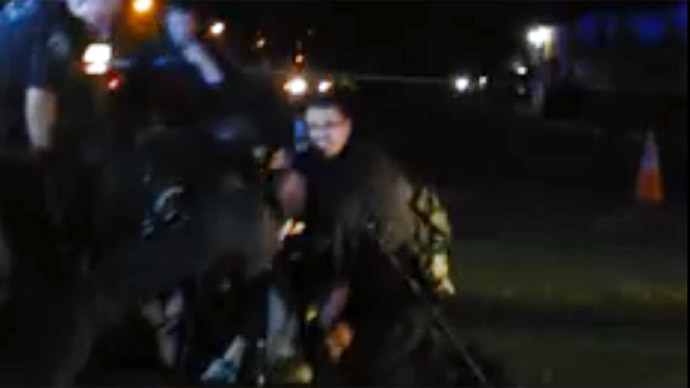 The San Jose PD acknowledged using physical force on Moreno-Lopez, the newspaper reported, but said he continued to fight with officers despite their attempts to restrain him. Less than a week earlier, the California chapter of the American Civil Liberties Union rolled out a smart-phone application aimed at empowering civilians to hold law enforcement accountable by providing an easy-to-use platform for recording police activity. The free “Mobile Justice CA” app lets iPhone and Android users record video footage from their mobile phones with a click of a button, then sends the clip straight to the ACLU.